We offer a comfortable, stress-free boarding area for our feline companions. They have a view of the outside with a bird feeder and a view of the fish tank from the inside. Each cat is housed separately with a private litter box. We feed Eukanuba Intestinal Plus to facilitate gastrointestinal health or you can bring your own food. We welcome belongings from home including bedding and toys. 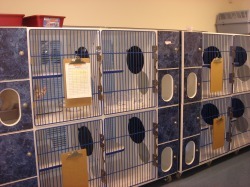 We offer many different sizes of cages for boarding of our smaller canine companions. They are walked at least 5 times daily and fed twice daily. We feed Hill's i/d unless their own food is brought with them. Toys and bedding from home are welcome but please be sure to label your animal's belongings. 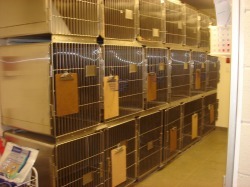 We offer 5 large indoor runs for larger dogs. The boarding area has it's own ventilation system and is climate-controlled. The animal's are offered soft bedding to make sure that their stay is as comfortable as possible. All boarding animals must be up-to-date on vaccinations and on an approved flea medication. 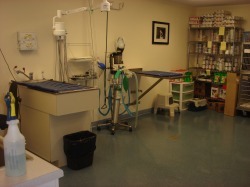 The treatment area was designed to emphasize flow and visualization of hospitalized animals. We have a wet table with drop-down oxygen and scavenger systems for dental cleanings and other non-sterile surgeries/treatments. Pediatric animals and animals that are very nervous are also boarded in this area. 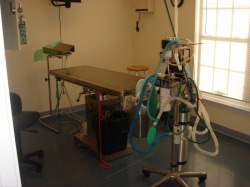 We have a state-of-the-art surgery room with a drop-down oxygen and scavenger system. We place monitoring systems on all animals under anesthesia and have a licensed technician at the side of all animals throughout their surgical procedures. A warm-water blanket provides warmth during surgery and the animals recover in a warm cage. We have a new digital x-ray machine. Most pictures can be taken and transmitted to the exam room within 5 minutes. For longer diagnostics or x-rays that may require sedation, we recommend a drop-off appointment. We have a full-service in-house diagnostic laboratory. 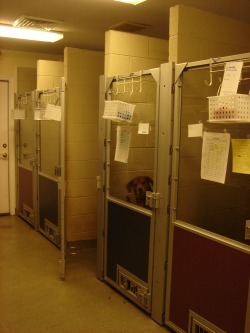 For more specific testing, we can send the samples to any number of certified outside labs. The sample are picked up daily and most results are ready within 5-7 business days. The laboratory is kept up-to-date with the newest technology. 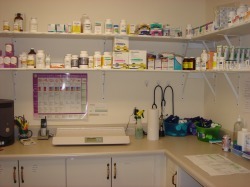 We keep the pharmacy well-stocked with most oral and injectable medications. We also have a full line of topical medications, shampoos, and nutraceuticals. We offer prescription foods in our check-out area including Hill's, Purina, Royal Canin, and Eukanuba.